Some 200 professional ham slicers were in action on Sunday in the ancient Spanish town of Torrijos in a bid to raise money for a charity by breaking the world record for the largest plate of a delicacy known as Jamón Ibérico, as witnessed by EFE photojournalists. 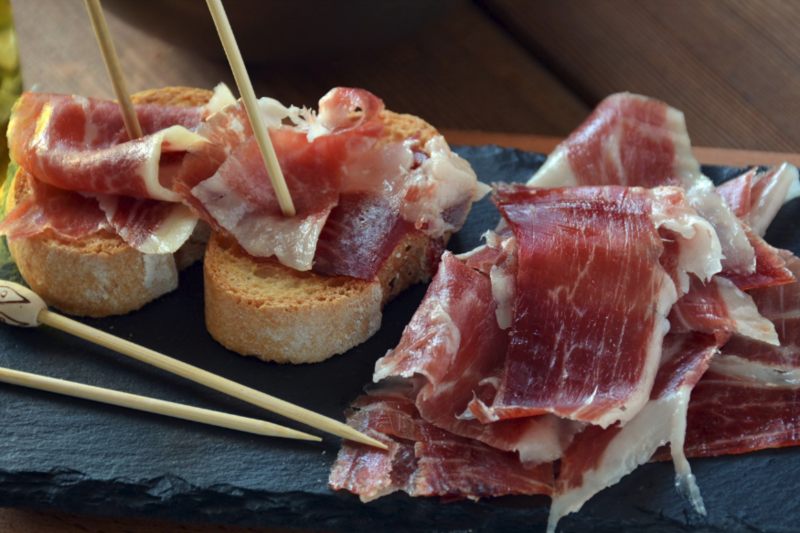 This type of ham, which is slow salt-cured in a traditional manner and is considered a delicacy by many in Spain, retains the central bone and so cannot be machine sliced. Hence, to be able to present a plate of this treat, specially trained professionals wielding long, thin and very sharp knives have to painstakingly cut the meat and place each individual slice. The ham comes from Ibérico pigs that are a native, black-skinned Spanish race that is traditionally bred and raised in the south-west of the Iberian Peninsula. Large herds of them live freely, or are partially free-range, and are able to graze on wild grasses but most particularly on fallen acorns. The previous record was set when slicers cut 400 kg of ham. On this occasion, the plan was to plate more than 500 kilos of jamón. The event was organized to raise funds for medical research unit of National Paraplegic Hospital in Toledo.